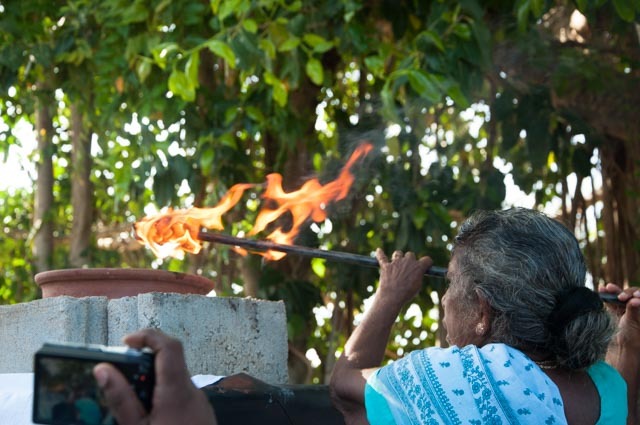 Several remembrances events were held across the North and East in Sri Lanka on 18th May 2015 (the day the war ended in Sri Lanka in 2009) by Tamils to remember those killed during the war. They were organized by Tamil politicians, religious clergy, civil society and women’s groups. Many were religious events. Most appear to commemorate civilians killed or all those killed. None that I saw had attempted to commemorate the government military or LTTE cadres that have been killed. 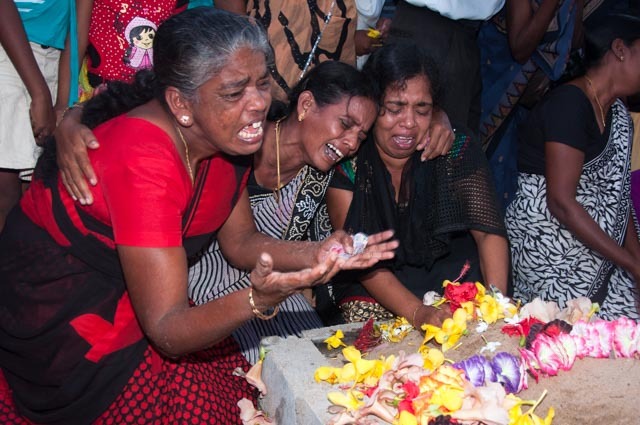 In contrast, the government’s commereation of the end of the war was a “War Heroes (Ranaviru) Day” presided over by President Sirisena on 19th May was focused on the military, despite references having made to remember all those killed during the war. 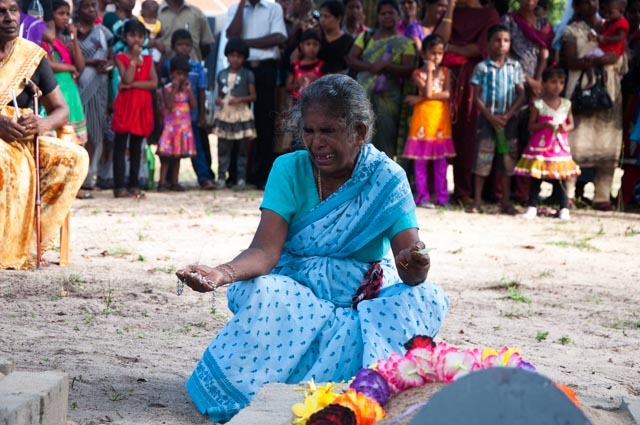 Since the end of the war, the Rajapakse government and it’s military and Police had aggressively obstructed commemorative and remembrance events by Tamils in relation those killed during the war. Organizers and participants have been threatened, harassed and intimidated. Many Tamils in North have told me their fears to organize or attend such events. But this time around, there were more initiatives than before, as people felt an opening of space to remember their family members in a collective and public manner. In one of the events I attended near the Mullivaikkal beach, a Catholic Priest boldly declared that “we have a right to cry and in the past, that right has been obstructed”. People who had gathered for this event lay flowers at symbolic tombs and cried their heart out for their loved ones who had been killed during the war. Significantly, a flame of remembrance was lit by an elderly woman who cried a lot. Unlike in previous years, I didn’t see, hear or read about uniformed military involvement in obstructing these events. The Police also appeared to have refrained from physically obstructing such events or explicitly threatening organizers of participants. However, there was strong Police surveillance of all events. There were lots of persons in civil who appeared to photograph persons who had organized and were participating at these events. Most local people I spoke to told me that they were “intelligence” persons from the various Police and military units. One such person in civil who had been lurking around tried to question me, and produced a Police identity card when I asked for identification. He and another person started asking whether I was a journalist and tried to also ask me information about foreign participants and foreign media present. I politely refused to be an intermediary. As my colleagues and friends including Catholic clergy gathered around me, he retreated. However, Police in uniform as well as civil clothes questioned foreign participants, including a foreign journalist who was wearing a clearly visible media accreditation card issued by the Ministry of Media. Christian clergy and Tamil politicians played a prominent role in organizing these events and thus, they had to face obstructions and intimidations. 7 bus drivers in Iranapalei had told Church leaders they had got calls not to transport people to a remembrance event in Mullivaikkal on 18th May and were unwilling to rent their buses. 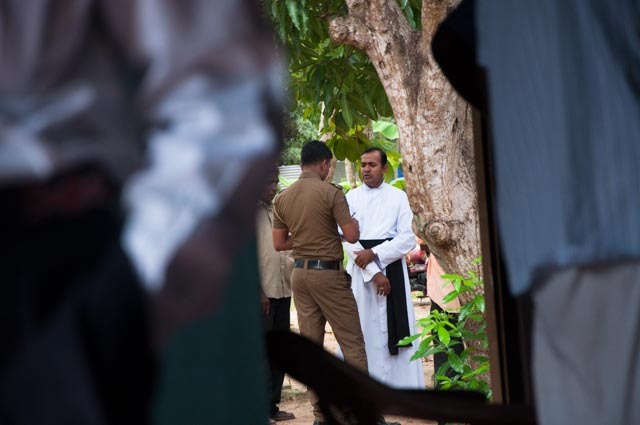 Christian clergy in Trincomalee had booked a venue from the Urban Council to have an event on 18th May afternoon, but Police had pressured members of the clergy, including the Catholic Bishop of Trincomalee to refrain from using that space for the event. 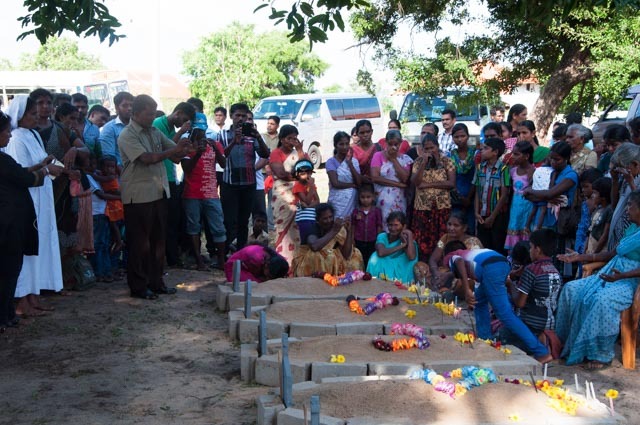 In an interior village near Killinochchi, during the annual remembrance event for a Catholic Priest who died on 18th May and others who were killed, Police questioned the Catholic Priest from the host Church when the Holy Mass was going on. On 15th May, Police had obtained a Court order to stop the Tamil National People’s Front (TNPF) and others from holding any processions in Mullivaikkal till 29th May. Later on, a senior Police officer had showed the same court order to leaders of a women’s group who wanted to have a remembrance and sharing event in Mullivaikkal on 18th May, and insisted that they should not have the event. There were several other such incidents reported in the media. 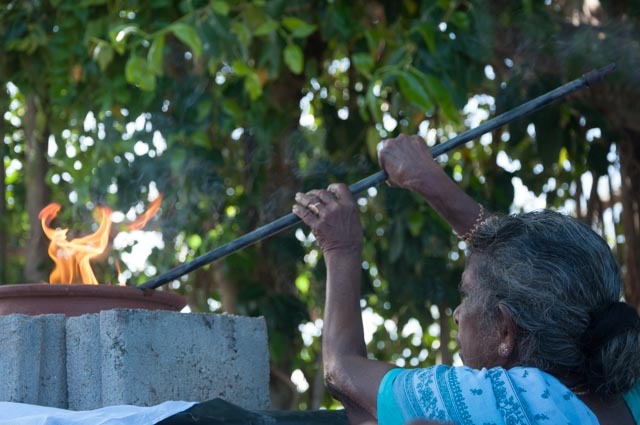 Police had taken details of participants at an event in Vakarai in Batticaloa district. 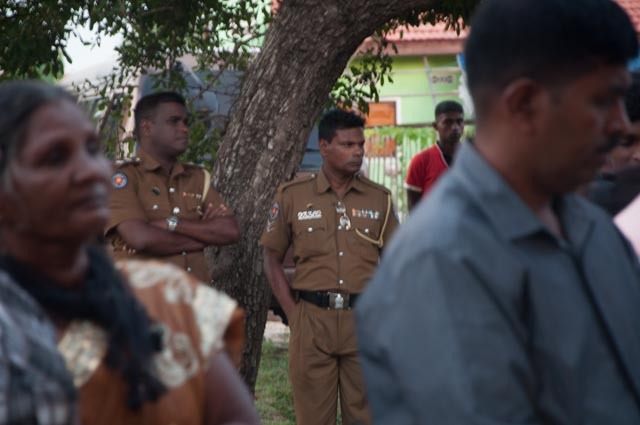 Increased numbers of “Intelligence officers:” were reported to have been present around the Jaffna university. Those who travelled to the event in Mullivaikkal led by the Chief Minister of the Northern Provincial Council were reported to have had their had their vehicles stopped by Police and questioned regarding their movements. A Court order against an event was also issued in Mannar. An event at the Eastern University in Batticaloa was also reported as banned by the Police. The stage was set for these restrictions in the first week of May, when Northern Provincial Council member was questioned about a lamps he had lit at home on 27th November 2014, on Marveer day (Heroes day) celebrated by the LTTE. 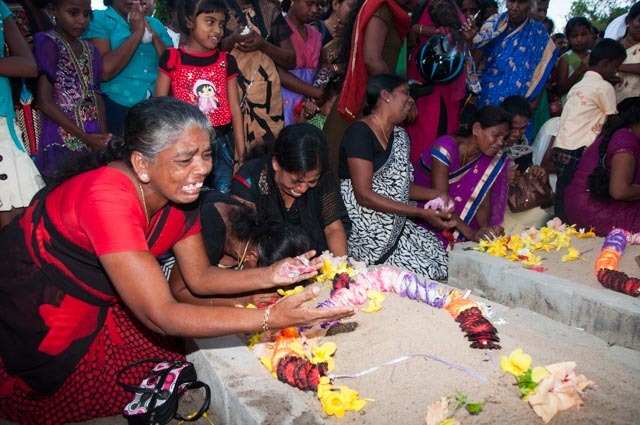 Remembrances and commemorations are complex in a situation such as in Sri Lanka. They appear to be deeply ethicized. The events I joined and others appeared to be exclusively Tamil, although few of my Sinhalese friends also participated at the events I joined. There was one Muslim and one Buddhist member of clergy at the event I attended at Mullivaikkal, but I’m not sure to what extent they shared the grief of the Tamils who were there. I didn’t hear about any initiatives that focused on Muslims and Sinhalese from victim’s perspective. Most Sinhalese appear to be taken up with the government’s “War Heroes day” event. Remembrances are deeply personal tragedies, but they are also about different communities and highly politicized. 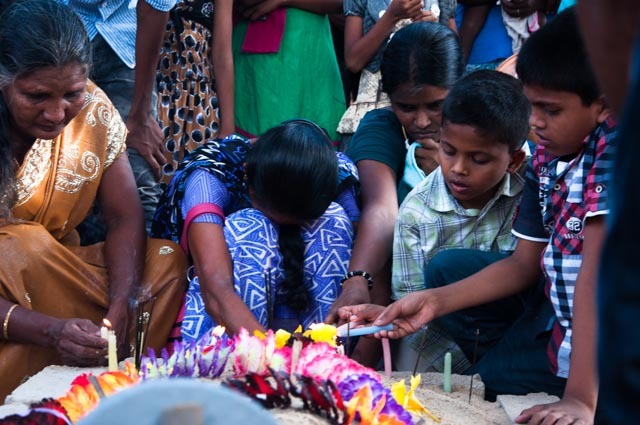 Although there has been a tradition of remembrance in Sri Lanka, there has also been a tradition of obstructing remembrances, which the Rajapakse government brought to be a new height after the end of the war. 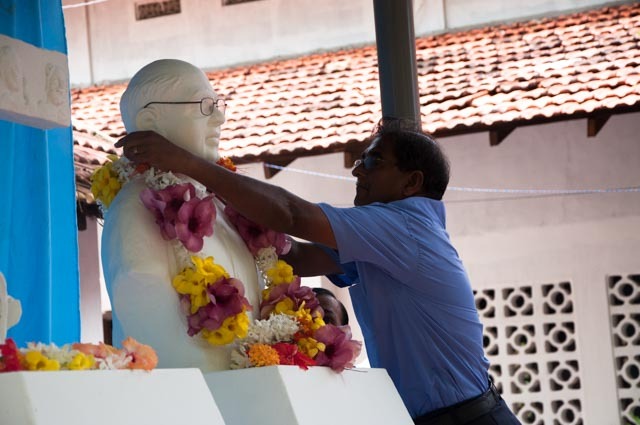 On 10th May, I participated in a seminar at the Jaffna Public Library on Right to Memory, where the rights of different communities to remember their family and community members killed due to violence and wars was discussed, including ideas of having multiple narratives and inclusive memorialisation. Issues related to commemorating those who had been part of groups that are responsible for abuses and tensions between private and public commemorations, personal and collective commemorations were also raised at this seminar. This was a good beginning for broader debates on the subject of remembrance and memory and I hope it will continue. 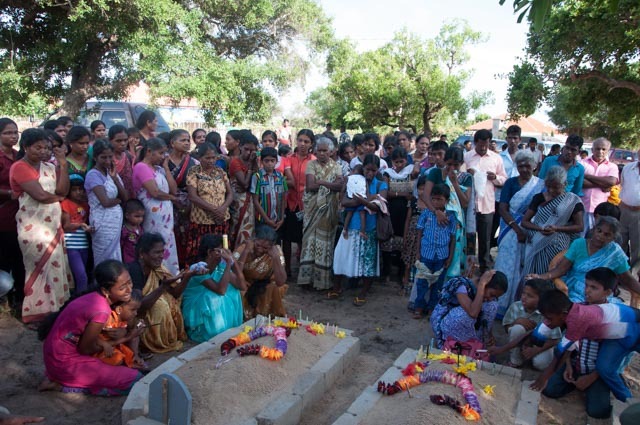 As I was in the train returning to Colombo, I got a call that another community in the Vanni, who had been fearful to remember their dead collectively, were planning to commemorate their family and community members killed before the end of May, after seeing and hearing about the widespread events held over the North and East. Despite the intimidations and obstructions, the determination of organizers and participants of the events offers fresh hope for a new era where the all Sri Lankans could enjoy the “Rights to Cry and Remember”, a crucial element for reconciliation and moving on after the war.